Here's a comprehensive guide to working with JBoss Data Grid for xPaaS, with a look at connecting Hot Rod clients in OpenShift. 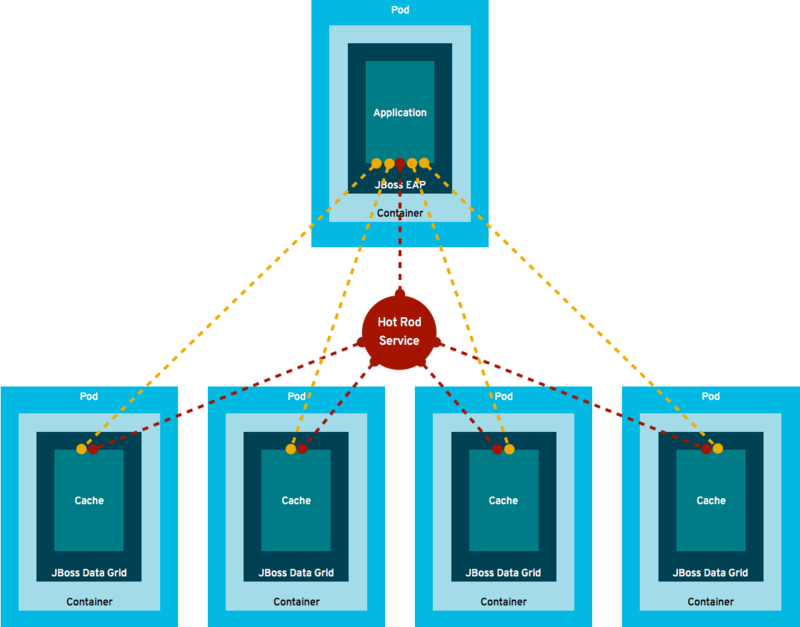 This article describes how to get started with JBoss Data Grid on OpenShift using the Hot Rod service. JBoss Data Grid for xPaaS is currently only supported in Client-Server Mode. Applications can remotely access the data grid server using Hot Rod, Memcached or REST client APIs. For details on the REST service please see here. Hot Rod is a binary TCP client-server protocol that enables clients to do smart routing of requests in partitioned or distributed JBoss Data Grid server clusters. The Hot Rod protocol facilitates faster client and server interactions in comparison to other text-based protocols and allows clients to make decisions about load balancing, failover and data location operations. 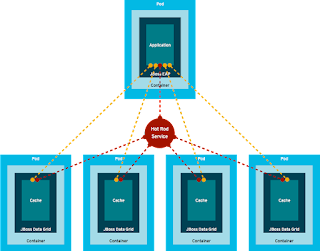 Hot Rod provides failover to a server cluster by the servers providing regular updates to clients about the cluster topology. In OpenShift one can access the DataGrid via a clustered IP address called Service. Exposing a Hot Rod services in OpenShift means that other applications running in OpenShift can access the data grid using Hot Rod and the clustered IP address. Default the Hot Rod service is listening on 11222, but the Hot Rod service is default exposed via 11333. The reason for this is that the Hot Rod client will connect via the service on 11333, but then the cluster view directly to the pods making up the service using port 11222. This way one can scale JBoss Data Grid by increasing the amount of replicas ( e.g. pods ) that are used. Since Hot Rod is aware of the cluster topology and also aware of the distribution mechanism Hot Rod clients can directly connect to the pod containing the data entry without having to do additional network hops. Above picture illustrates an example of an application running in JBoss Enterprise Application Platform accessing a cluster of JBoss Data Grid nodes in a single OpenShift project. The red connections illustrate how the client connects to the cluster and get the full topology of the cluster back. The orange connections illustrate how the application access data in the data grid. If we have the EAP application in the same project it will automatically get the following environment variables populated.